Every day or so, I open up an app on my phone called Timehop. It is an app that lets you see your photos from exactly this day in history. The kids and I enjoy the walk down memory lane as it shows us pictures from eight years ago, five years ago and so on. And there it was- as clear as day. The picture of the table I didn’t buy last year at the WeeTRADE Spring sale. I had snapped a picture of this perfect white table to send to my husband. I remember his response was something like “if you really want it, get it”. I can’t tell you why I didn’t buy it. It was the perfect size for my growing elementary school-age kids. It was in great condition and very reasonably priced. I probably became distracted with the amazing deal I found on an American Girl doll or the many pairs of cleats I purchased for my son. But now- even a year later- that picture of the perfect white table still haunts me as the one that got away. Sure, maybe I am being a tad bit dramatic. 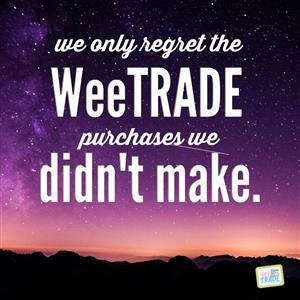 But as a veteran WeeTRADE shopper, I can assure you- there is nothing worse than WeeTRADE regret. It is that feeling you get knowing that the deals you find at WeeTRADE are both amazing but fleeing and only happen twice a year. I have put together tips on how to avoid your own WeeTRADE regret. Shop with an open mind. Some of the best deals have been on items I hid from my kids for months. Find something perfect for the holidays and it’s only March? Hide it in a friend’s garage. Not sure if your child is old enough yet for that tricycle? Buy it now (at the fantastic WeeTRADE price) and save it until they are. Shopping with an open mind means thinking ahead! When in doubt, just buy it. I hope no one is haunted by WeeTRADE regret like me. Let my lovely white table serve as a haunting reminder. Just buy it. If you get home and you hate it, sell it at the next sale. It’s really that simple. PS: I hope wherever this table is, it is happy and loved.